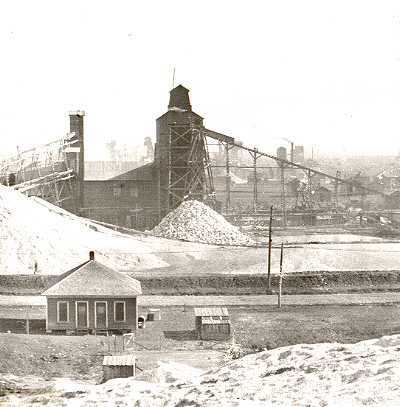 Here is a series of Picher, Oklahoma when it was young and untamed. I believe that this view is taken from the Premeir mine tailing pile. 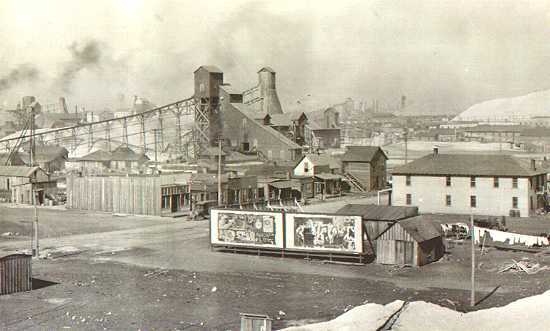 The large mill is the St. Joe. It was on South Main Street and next to where the old city park was. Note the store buildings which are about where that park was. The big building is a rooming house where miners rented rooms. There is a washing on the clothesline behind the shack and a big billboard advertises something. Picher was four years old when these pictures were taken. Looking east from the Premeir mine you can see this large mine and mill, which is probably the Black Hawk mine and mill. In the foreground is one of the better houses of the time. It looks like it has a two hole outhouse from the size of it. The road in front of it is probably Connell Ave. This is Picher's first source of water. The well was drilled near the Netta mine in 1916 and the water tank was then built. Here we see the wagons lined up to haul the water to residents who then filled their water barrels and the water was used for everything from drinking to bathing. The cost of each barrel of water was 25 cents. This well was used until about 1920 when the new tower was built on the east side of Connell where it remains today. The first tower is visible in many of the photos of the Netta Mine as seen looking west from the Bingham mine. 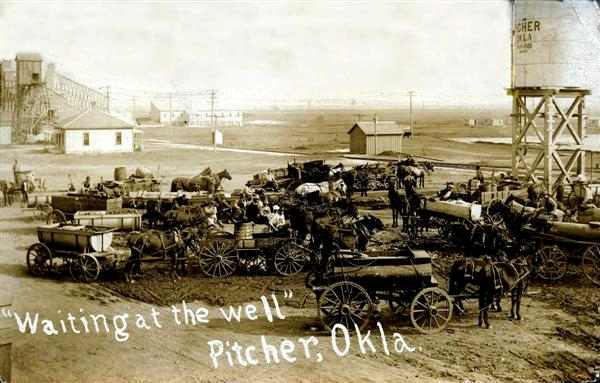 I have heard that the original well was around 12,000 feet deep. The mine at the left side of the photo is the Crawfish mine, first mine at Picher. Photo courtesy of J. Taylor.